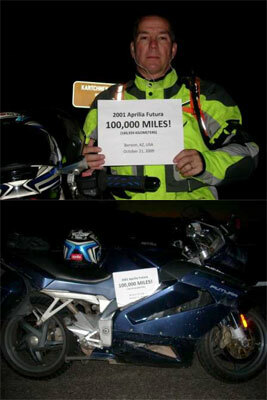 Apriliaforum member Fanatic’s 2001- built Futura is believed to be the first to hit the magic mileage when he passed the 100,000 mile mark one morning on his way to work in October 2009. And as you can see from the pictures, he was ready for the occasion. But even more remarkable is the excellent condition of the bike after covering all those miles and how few issues Fanatic, who has owned the bike from new, encountered along the way. The engine is as strong as ever with 5,000 mile oil changes (Mobil1 Fully Synthetic with about 6 ounces of Lucas synthetic oil stabilizer) and a single exhaust valve adjustment at about 55,000 miles. Chassis-wise, Fanatic, who lives in Vail, Arizona, USA, has replaced the steering head bearings, the front wheel bearings, the rear wheel internals and rear brake disc. It’s also had a single set of front brake pads. It’s had a chain and sprockets every 15-20,000 miles and although a little tired, the stock rear shock is still in place. It gets a hydraulic fluid change once or twice a year, a fork oil change every year, and goes through three rear tyres and 1-2 front tyres a year. Apart from the usual clutch slave issues – dealt with at 15,000 miles by replacing the stock slave cylinder with an Evoluzione item – most issues have been electrical. It’s had a coil, a turn signal relay and a starter solenoid, a couple of headlight bulbs, but most annoying have been two or three mysterious electrical faults. Fanatic explains: “The electrical stuff, which I won’t touch, has been the only real sandpaper in the KY jelly. Other than that there’s only been one fly in the ointment: “I had a mild low side in Dec 2006 that put some Arizona pin stripes on both sides and snapped both mirrors off. I replaced the mirrors with ones from a Mille. Can’t see sh*t behind me but they’re legal and have the integrated turn signals. The bike has remained pretty much stock. It got the 05 Map early in its life, but other than that the only mods are the clutch slave and a Brembo radial brake kit from AF1. Oh, and detachable heated grips from Aerostich. The proof. 100,000 miles on the clock. Fanatic says: “I bought it new in summer 2002. From then until March 2006 I put only about 19,000 miles on it, then I got a new job with a much longer commute – about 120 miles round-trip. The remarkable condition of the engine may also be due to its sympathetic treatment from cold: “I let it warm up for 3-4 minutes before I leave my driveway. So a Futura will last at least 100,000 miles in the hot and dry climate of Arizona, but this bike’s never seen rain, right? 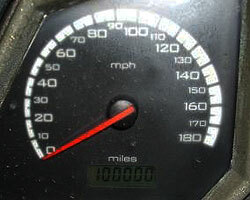 Fanatic is thought to be the first owner to clock 100,000 miles, though there are many not far behind on both sides of the Atlantic. 50,000 mile bikes are relatively common, indicating that despite its flaws the bike was built as well as any production bike. With 128,000 miles on the clock, Fanatic finally decided to sell the bike to someone who could give her a little more TLC – and not a 600 mile a week commute. 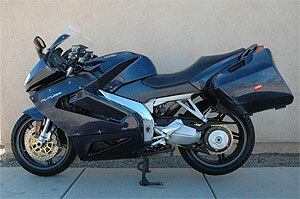 The bike is still going strong with its new owner, but isn’t racking up the miles at the same rate these days.